With the plenty of handbrake turns, the ‘sporty’ themed commercials for the new Maruti Suzuki Swift already running on television screens, once again positions it as a car for the youth and for those who seek a spirited drive. That said, this time around that’s not going to be enough to lure in the enthusiast buyer as there are now a couple of hot versions of ordinary models similar to the Swift. Unlike the time when the first Swift was launched here in 2005 when there were no proper hot hatchbacks on the market, this time around there are 100bhp models to challenge the Swift’s tall claims. So, without further delay, let’s see how Maruti’s ‘Sporty’ new Swift stands against its proper hot hatchback rivals. As expected, the Swift has the least powerful engine of the three cars here and it is the only one to not have a turbocharger. But this setup combined with the lightest kerb weight ensures that the new Swift is the most fuel-efficient car here. And until we do a proper performance test, it would be unfair to comment on which would be the fastest car here. Having said that, the Swift’s naturally aspirated petrol engine revs very cleanly and easily across the rev range which is wider, whereas the RS’ turbo engine has a meaty mid-range but not the most responsive low end. And even though the GT TSI has a slick shifting autobox, there are times when you would wish for more immediate shifts during spirited driving. But the new Swift does not have the same sharp handling traits as its predecessors, which made it quite the hoot to drive, especially in the petrol guise. That said, it is based on the same platform as the Baleno, which itself has fairly good handling traits. Meanwhile, the Polo is a pretty sweet handling car in its own right. Because of their superior powertrain, both the GT TSI and Baleno RS cost a fair bit more than the Swift petrol as well. 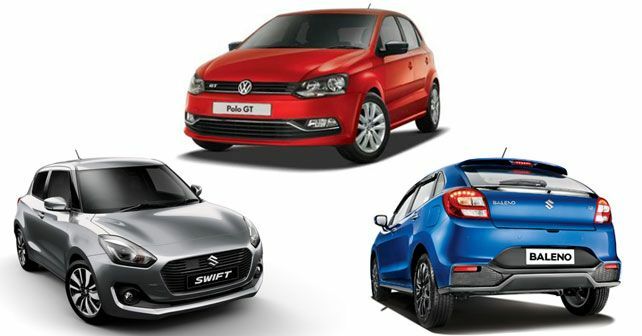 So, in all fairness, the Swift actually stands in competition with the likes of the Ford Figo and Hyundai Grand i10 on the price front. Here is a look at how it compares to them on the powertrain front. As you can see in the table above, all three cars come with similar engines that have near identical power outputs. But in the real world it’s the Suzuki engine that feels the most willing. It revs the most freely of the lot and has the best efficiency rating. Making the Swift, the hatchback of choice. However, if its safety you are after, then the Figo with its six airbags and safe structure is the undisputed king of the segment. When it comes to equipment, the Swift and Grand i10 are neck and neck with modern kit being fitted on the top end versions featuring satellite navigation, touchscreen infotainment systems, reverse cameras and sensors and more. The Figo isn’t too far behind but falls behind in terms of reverse assistance systems as it comes with nothing at all really. Still, the Ford offers an extremely spacious cabin and a very comfortable ride no matter what the surface. It is also worth noting that despite being the oldest car here, the Ford offers the most bang for your buck. The Swift meanwhile will find takers everywhere because of its appeal and the Maruti Suzuki badge.